Our company was formed in 2007, at a time when no other Master Plumber was focused on RPZ devices. 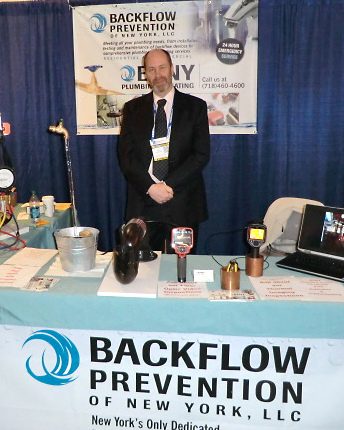 Backflow Prevention founder, Paul Paddock realized this little-noticed set of devices that regulate “back siphonage” was about to become a big issue in New York City. With construction and growth at record highs, and city infrastructure under constant repair, Paul understood that Backflow Prevention devices would need expert attention and ongoing service. When New York City law changed in 2008 to mandate testing, Backflow Prevention of New York was ready. No other plumbing company has assembled a team with such a high level of insight and scope of experience in this area of plumbing. Paul Paddock and his team have stayed on top of all developments in Backflow Prevention regulation and materials. Backflow Prevention of New York has serviced some of New York’s most high-profile infrastructure as well as major institutions and schools, large and small medical facilities, and other structures where Backflow Prevention matters. Paul brought on David London in 2013. Literally one of New York’s most well-known plumbing experts, David is managing Backflow Prevention’s plumbing division, known as BPNY. Behind BPNY is the same mission that drives Backflow Prevention: to offer smart problem solving backed up by expertise and service. No other company offers this level of expertise. USC Viterbi School of Engineering Foundation for Cross-Connection Control and Hydraulic Research.